No Speak was an instrumental-only record label, founded by Miles Copeland in 1988. To complement the release of the label’s Guitar Speak album, Copeland organized a week-long “Night Of The Guitars” British tour with many of its featured artists. The line-up was truly stellar, and featured Copeland as Master of Ceremonies and the following guitarists: Randy California (Spirit), Pete Haycock (Climax Blues Band), Steve Howe (Yes), Steve Hunter (ex Lou Reed band), Robby Krieger (Doors), Alvin Lee (Ten Years After), Andy Powell & Ted Turner (Wishbone Ash), and Leslie West (Mountain). Each guitarist played a few songs of their own, backed by a “house band”. Highlights were Randy California playing “Hey Joe”, Powell & Turner with “The King Will Come”, Steve Howe performing “The Clap” and Leslie West with “Theme from an Imaginary Western”. But best of all was Robby Krieger who was introduced as the star of the show and played an impeccable version of the Doors “Love me Two Times”. The London gig was recorded and the album contains the songs below. The show I attended featured a similar set. Steve Howe is an excellent guitarist with his own, very individual style. He cites several guitarists as influences including Les Paul, Barney Kessel and Chet Atkins. When I first saw Steve in Yes in 1971 I was struck by the Gibson ES-175D that he was playing. About this guitar, Howe said: “No one was playing archtop, hollowbody guitars in a rock band. People laughed at me and thought I was really snooty. To me, it was an object of art, it wasn’t just a guitar”. I was blown away by his performance of “The Clap” that night, and have remained a fan ever since. The way that he blends jazz and classical influences with rock defines his uniques style. A few years later I was equally impressed by “Mood for a Day”. I spent ages trying to learn to play it, and never got past the first few minutes. I have seen Steve twice in solo concert, both times with my mate Will. 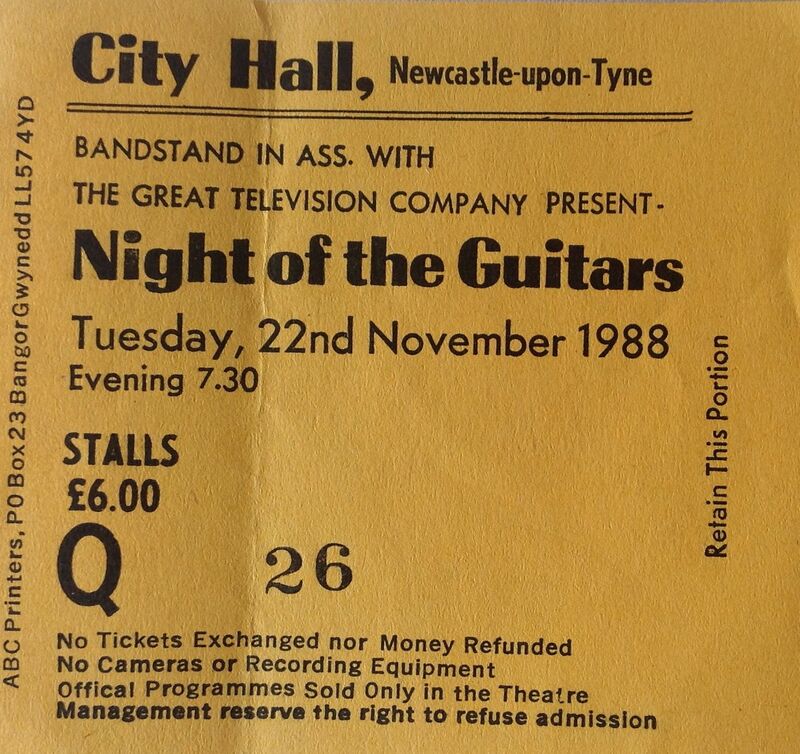 The first time was a concert in a small room in South Shields Temple Park Leisure centre, with support from Isaac Gullory. The second was at the Sage more recently when he performed with the Steve Howe trio which features his son Dylan Howe on drums and Ross Stanley on Hammond organ. The trio is very jazz oriented, but still perform versions of some Yes classics. 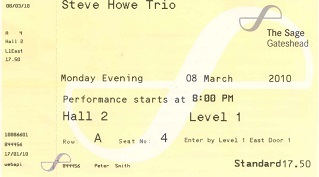 For me a Steve Howe concert isn’t complete without “The Clap” or “Mood for a Day” (and ideally both!). 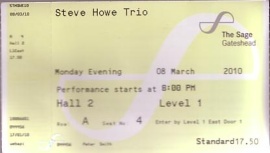 Will and I went to see the Steve Howe Trio at the Sage on Monday. Laura and her friends were in Hall One watching Grizzly Bear (must admit I didn’t know who they are) while we were in Hall Two for Steve. Steve’s Trio consists of himself on (of course) guitar, his son on drums and a fine keyboard player. He opened the first set with a jazzy version of He Ain’t Heavy which was rather appropriate as I had been to see the Hollies two days before. The rest of the set, which was in two halves, consisted of instrumental versions of Yes classics and some jazz pieces. Steve is undoubtedly a fine guitarist, but I found the material a little too jazz-oriented for my liking. Highlight for me was a great version of Heart of the Sunrise.